Note: Your chromebook should automatically update itself when restarted. If you are having issues connecting to the wireless, you can manually check for updates. 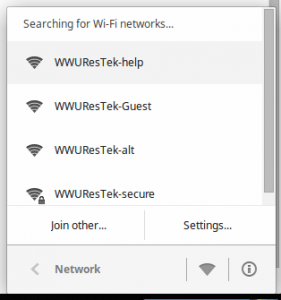 Click the wifi button in the bottom corner of the screen. 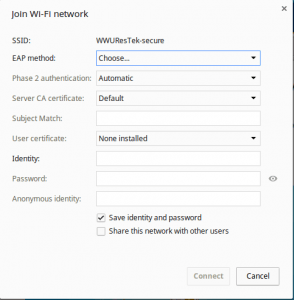 Choose WWUResTek-secure from the list of available wireless networks. 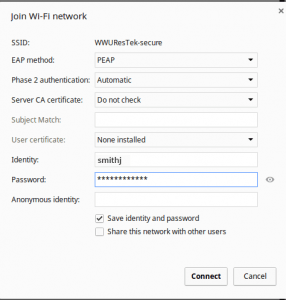 Follow these troubleshooting steps to make sure your computer is set to automatically obtain an IP address from the network. If you are using these instructions to troubleshoot your connection, you should open your web browser and attempt to visit a website once you have saved the changes. Check the Configure automatically checkbox.